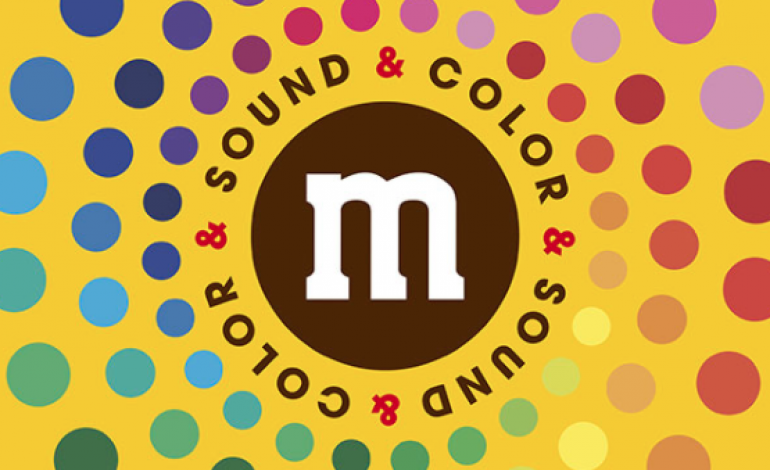 There’s another stellar event added to Collide’s burgeoning list of events at SXSW 2018: Sound + Color presented by M&Ms! 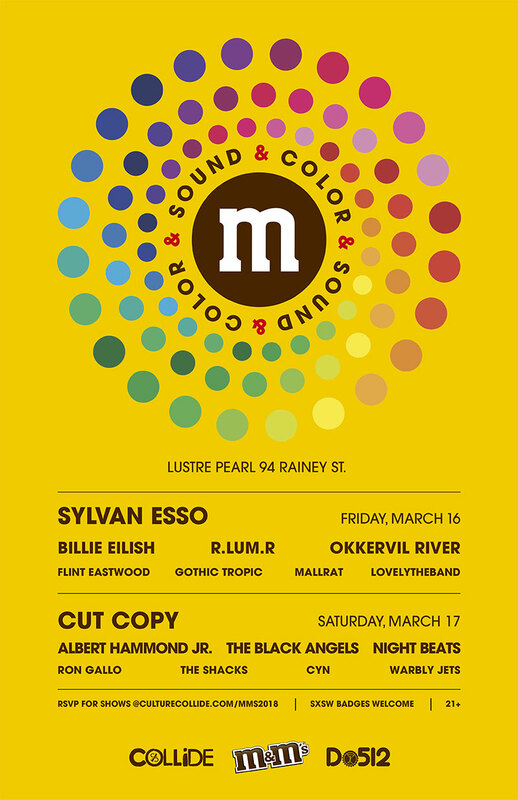 The event takes place at The M&Ms House, taking over Lustre Pearl Rainey across Friday and Saturday over the weekend of SXSW music. The description promises interactive art exhibits on the premises in addition to the strong lineup of artists from around the world. Attendees of the free daytime events will catch Neon Gold’s indie rock group Flint Eastwood, sure to be playing songs from their 2017 album Broke Royalty, Austin’s own Okkervil River, and the bright, up-and-coming pop newcomer CYN. Night shows should be official SXSW badges/wristbands only, but feature shows from huge names like Grammy nominees Sylvan Esso, BBC Sound of 2018 Longlist member Billie Eilish with her haunting, darkly catchy pop, Australian electronic standards Cut Copy, and many, many more! Read on for full set lists, event details, and the ever-important link to RSVP for free entry to day shows! Head over to culturecollide.com/mms2018 to RSVP! Please note the event is 21+ only. The free day show on Friday, March 16th features Lovelytheband at 2pm stopping by on their North American tour, Mallrat at 3pm, Gothic Tropic at 4pm, Flint Eastwood at 5pm, and Okkervil River closing the day at 6pm. The night shows start back up with the stirring soul of R.LUM.R at 9pm, Billie Eilish at 10pm, and Sylvan Esso at 11pm. Saturday, March 17th starts back up with Warbly Jets at 2pm, CYN at 3pm, The Shacks at 4pm, Ron Gallo at 5pm, and Austin’s local psych rock stalwarts The Black Angels at 6pm. The shows crank back up at night with Night Beats at 9pm, Albert Hammond Jr. at 10pm, and close with Cut Copy at 11pm! You’ll want to hang out early if you’re keen on a specific show, events on Rainey are extremely popular in general during SXSW, and between the well-known acts playing here and the strength of the other Collide events happening nearby, this should be a very busy venue! The good news is odds are high you’ll have plenty of M&Ms available to keep your strength up if you need to stick it out for the long haul.